It’s an established fact that a good copy is a necessity in marketing. Whether it’s for a sales letter, an ad copy, a product description or a video script, creating copy is a process that needs the utmost care. The copy is the voice that sends out your marketing message, therefore, a thorough understanding of who your target market is, what the product is, how your product solves your target market’s challenges, etc. is something that should resonate within your copy. A good copy separates your brand and your products from competitors. This means that a good copy allows you to make a name for yourself. A good copy entails results you can measure. This one’s pretty obvious since a good copy is almost always sure to bring increase in important metrics such as engagement and conversion. With a good copy, it’s easy to roll out a marketing campaign within a set budget. A good copy converts to sales. This is a no-brainer. A terrific copy has the power to enthrall your audience and compel them into acting on whatever you say, in this case, to buy in. A highly engaging copy does just that. Writing copy isn’t an easy task. Even the most seasoned of pros in marketing will find this task daunting sometimes, if not all the time. Afterall, not all marketers have the ability to write copy that will resonate to their audience and convert the audience in the process. Creating content is already a daunting process as it is – creating copy, even more so. And if you’re a marketer, you will understand how this process is not something to just shrug off and just thoughtlessly churn copy for the sake of creating copy. It doesn’t work like that. Now, I’m not trying to put pressure on you to create good and effective copy. I can, after all, understand that not everyone is born with the talent to weave words together into something that engages the audience, much less act on it and convert. And natural writers don’t always cut it when it comes to creating good copy. It all boils down to honing that skill and perfecting that skill until it becomes second nature to you. But let’s just face it, if we’re going to be realistic, it’s going to take a lot of time if we want to do it ourselves. Of course, we can hire experienced copywriters, but what if we don’t have the time or the budget to hire one? Funnel Scripts is ClickFunnels script writing platform that solves our very need to create compelling copy – a copy that engages the audience and converts them in the process. What I like about Funnel Scripts is that it isn’t like the cookie cutter copy generator you can find over the internet. If you take the time and browse through the script writers available to Funnel Scripts, you’ll find that it not only focuses on what you want to say to your audience, but it creates copy according to your target market, their needs, challenges, problems and how you think your product or service can solve all of those! The next best thing about Funnel Scripts is that it is incredibly easy to use! And I mean that, literally. All you need is to fill in the information asked in the forms, click Submit and voila! The copy is ready to use. You don’t have to know much about copywriting, either because Funnel Scripts does the job for you. How convenient is that? You can get all of Funnel Scripts features and bonuses for a steal of a price at $497 annually. Imagine that! It will only cost you a little over $40 a month and you get unlimited access to Funnel Scripts wide selection of script writers. As stated over and over, Funnel Scripts is an incredibly easy to use tool. You aren’t even required to download a software and install it to our PC because it is web-based! What makes Funnel Scripts absolutely easy to use is that all you are required to do is to fill in what is asked in form. The scripts are even editable! What this means is that you get to do away with the hassles of having to create your own scripts from scratch. You get to learn awesome pointers as well from the training videos available. You get to do your copywriting tasks while leveling up your copywriting skills while you’re at it. Also, creating copies with the script writers is made even easier with the tutorial videos and extended training! To let you know just how awesome Funnel Scripts is, we’ve created a list of the awesome features to expect when you get your own copy! First up on the list of script writers is the sales copy and video scripts. Now, we all know how important marketing copy is to any campaign. It can make or break it, afterall. This section is dedicated to marketing copies with the #1 goal which is conversion or SALES. This one’s a cool new script they have just added especially since Amazon product description has gotten trickier as of late. What’s more, this script isn’t solely just for Amazon, but for any other purpose where you need to add engaging product descriptions. As the name suggests, this script writer is your go-to if you want to create winning CTA scripts. These scripts can be used to create customised CTAs for your images, texts, and CTA buttons! This one’s an insanely awesome script writer especially for those who find it hard to write effective lead capture copies! You can use this on just about any platform where you want to run a lead generation campaign to build your opt-in email lists. However, these scripts are most effective when used on squeeze pages. These scripts work best for “Try Before You Buy” offers whether it’s for a sales copy or for a video script. This script capitalises on the Big Payoff that the lead will realise within a certain amount of time. If you are looking for a script convincing your clients or customers to write you impressive testimonials, then this script writer is your best bet. This script writers is a great complement to the order bump feature of ClickFunnels. If you’re looking to create an effective Order Bump, then this is a great script writer to use. Storytelling is a great way to increase engagement and conversion. This script writer is your go-to if you want to sell something by creating a sales story. This one’s a great script writer for those who offer coaching or other services. This script writer is for a One Time Offer for coaching or a service for your customers to purchase after buying from you to help them get the results they want faster. You can either offer to coach them or do it for them as a service. This script writer is for a One Time Offer product or service that is the Next Thing or Next Step for your customer to purchase after their prior purchase from you. If you’re looking for video scripts to use on your website to get more opt-ins, this script writer does that job. This script writer writes the first draft of a video script. It also writes the slide text and the basic text for a web form you can put on a landing page. This script writer is a great tool for sales announcements. If you want to write a compelling copy with all the essential elements of a great sale announcement in one script, then this script writer should be your top choice. 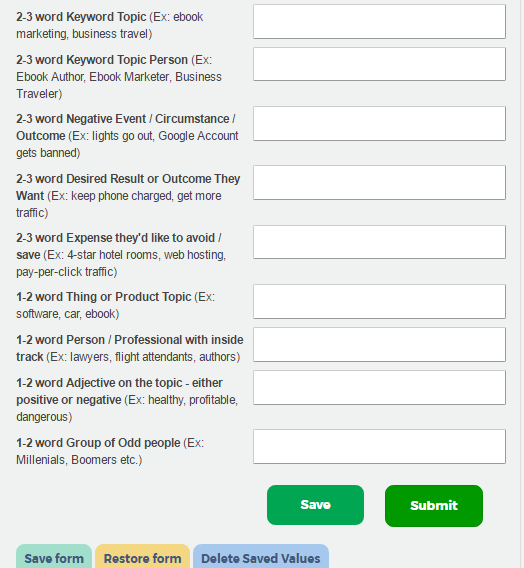 This script writer creates opt-in sales copy and video scripts aimed to compel visitors to sign up for your Free Events. These events include your webinars and teleseminars. This script writer is a great choice when you want to create sales copy which hits the main points of your offers and build credibility as quickly as you can. This is the script writer of choice when you want to create copy for low cost offers, free + shipping offers, or sales where it doesn’t require a lot of explanation or even long sales letters! The next on the list of types of scripts to create are bullet scripts. These script writers are great choices if you want to make your bullet points more compelling and engaging, allowing your targets to know more about your offers, the features of your products or service, and what these offers mean for them. This bullet script writer, named after Russell Brunson, is what you need to create bullets for your Brunson Boxes. FBM stands for Feature, Benefit, Meaning. This script writer lets you create bullets that enumerate what your product or service is, what it does and what it means for your target. This is a bullet script intended to compel your targets to take action. The 3rd on the list of scripts available to Funnel Scripts are the Advertising script writers. These script writers are made for helping you create engaging and high converting Ad copies. This script writer helps you create curiosity-driven ad copies which compel and inspire your target audience to click on your ads out of..you guessed it right..curiosity. This ad copy usually discusses the challenges we seek to overcome and what big results we want to get from overcoming the challenges. This script writer is made especially for Facebook Newsfeed Ads. It creates the ad copy you need to create click-worthy ads for Facebook. Create compelling subtle or “under-the-radar” Calls-To-Action with this script writer. Your audience wouldn’t even notice that they are actually CTAs. Next up of available script writers on Funnel Scripts are the Content Creation scripts. These are script writers that help you create copy to promote your content. This script writer lets you create report cover letters, ads, optin-page copy and more to promote the Free Report you are offering. This script writer is a great source of idea starters which aren’t only for emails but also for articles, blog posts and social media. Next up on Funnel Scripts‘ line-up of script writers are the Email script writers. These script writers let you create engaging and high-converting follow-up and promotional emails. This is one nifty scrip writer if you’re looking to create copy for your entire follow-up email marketing sequence. Create your ebook, webinar, free report email follow-up scripts with this script writer. Now, this is another awesome script writer. It lets you create email teasers and event tweets! This script writer helps you create promotional copy for your free and paid webinars. This script writer lets you create follow-up email copies you can send to those who opted in to your webinars. As the name suggests this type of script writers’ purpose is to create compelling title or subject lines engaging the reader while making them want to read further. The email subject line is like the welcome mat to your house. Oftentimes, readers decide on whether to read their emails based on the subject line alone. This script writer is your go-to if you want to create engaging subject lines which will make your readers want to open your email. This script writer lets you create attention-grabbing headlines aimed at stopping people in their tracks! This script writer creates a simplified version of the classic long-form headline. This copy cuts straight to the heart of the matter with its concise discussion of all the key points of your offer. This script writer is a gem! It helps you create unique titles and domain names. The last type of existing script writers under Funnel Scripts are the Sales Letter script writers. If you’re looking to create sales copies, be it long-form, short-form or video sales letter scripts, these script writers should be your go-to. As the name suggests, this type of script writer focuses more on creating a detailed form of the copy. Since the long-form sales letter is much of classic form, all the key points of your offer will be thoroughly discussed while making sure that it produces high-quality copies that are sure to engage and convert. The short sales script is the abbreviated version of the long-form script, but it still packs a punch when it comes to conversion. It covers all the key points of your offer. This script writer is a great tool if you want to get a headstart on your PowerPoint video sales letters. 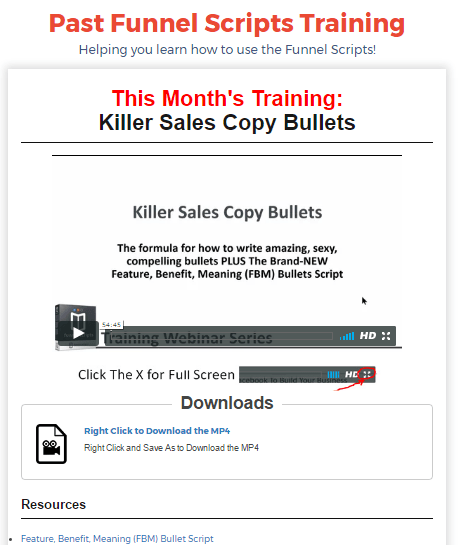 Just when you think that copywriting doesn’t get any easier than it is now, thanks to Funnel Scripts – out comes the training that comes with your copy! Funnel Scripts lets you sign up for live member training aside from their wide selection of training videos. This section is where you will find previously held trainings. Here you’ll find a treasure trove of training videos that will help you make it a lot more easier to use the script writers. A cool feature in this section is that it allows you to donwload an MP4 file of these trainings. This section has all the demo videos you will need for a step-by-step guide to making sure you get the most out of the scrip writers and create winning copies. Funnel Fridays is a live video talkshow happening every 11:00 AM EST. This live hangout talks about everything you need to know including funnel building, funnel hacking, various types of funnels, new ClickFunnels features, new Funnel Scripts features, affiliate marketing, tips and tricks and just about anything you need to make your funnels a success. If you think it’s over, well.. it’s not. Not only do you get access to, quite possibly, the most fantastic copywriting tool there is available, you also get to download these script wizard software designed to help you create fantastic copy for webinars, surveys, VSL and storytelling scripts! Another great thing about Funnel Scripts is that you aren’t limited to just the script writers available. Funnel Scripts lets you suggest other types of scripts that aren’t found in inside the tool yet. I personally think that this feature is great since marketing and advertising is always evolving. It’s assuring for me to know that Funnel Scripts keeps their script writers up-to-date. Funnel Scripts isn’t only made for complete beginners or for those who do not have a single copywriting knowledge. There is always something new to learn with all the training and pointers available. What’s more, the script writers available to Funnel Scripts make it possible for experienced copywriters to further hone their skill in creating winning copies for whatever marketing campaign. Like I said earlier, one thing that makes Funnel Scripts a success is that it not your run-of-the-mill script generator that churns out cookie-cutter copies. Funnel Scripts make it a point to include key areas such as your target niche, your ideal target customer, what they need, the problems or hurdles they face, their goals, etc. Essentially, the script writers help you create copies that your audience can relate to. This, in turn, makes it possible to gain more conversions. In summary, Funnel Scripts is a complementary tool for your marketing activities especially if you want to create copies on the fly. With its stellar line-up of features and bonuses, it’s a must-have tool for any marketer. Someone from Bolton built a funnel 21 minutes ago. Someone from Philadelphia built a funnel 37 minutes ago. Someone from Wellington built a funnel 36 minutes ago. Someone from Bolton built a funnel 15 minutes ago. Someone from Trikala built a funnel 42 minutes ago. Someone from Bristol built a funnel 46 minutes ago. Someone from Budapest built a funnel 49 minutes ago. Someone from Manchester built a funnel 40 minutes ago. Someone from Auckland built a funnel 33 minutes ago.